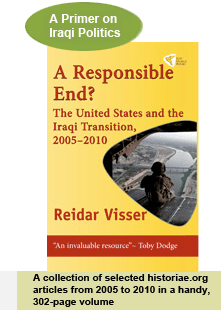 Back in 2005, it was often an uphill struggle to argue that the influence of ISCI (then SCIRI) within the grand Shiite coalition known as the United Iraqi Alliance (UIA) was generally exaggerated. Only after the local elections in January 2009 was the gradual weakening of ISCI acknowledged more widely, even if that trend in reality had been in the making for many years. Today, the partial results of the parliamentary elections indicate that the open-list system – whereby voters may override the backroom dealing and wheeling of the party cadres – has contributed to a further marginalisation of ISCI within the reconstituted Shiite alliance known as the Iraqi National Alliance (INA). Based on a prognosis of 67 INA seats, the results so far clearly indicate a Sadrist lead with 34 or more than half of the seats. Given the increasingly critical condition of ISCI with an obvious leadership vacuum after the death of Abd al-Aziz al-Hakim, it now makes sense to distinguish between the former militia (Badr) and the political wing (ISCI), especially since it seems Badr has a certain core electorate in some southern provinces. They get around 8 seats each, which is less than half of what the Sadrists get even if Badr and ISCI are counted together. The women’s quota will interfere with the final count: It does seem that the Sadrists have made a point of including a substantial number of female candidates on their lists, but in practice the women’s quota in this game will sometimes serve to strengthen the default ordering of the party elites against the wishes of the electorate. It is difficult to predict exactly what effect this will have, not least since some lists have fewer women on them than they should have had. Other trends include dismal performance by the Jaafari wing of the Daawa (which had a far more respectable performance in the local elections only a year ago). Fadila is also reduced, but has been in decline for a while. Significant failures include Wail Abd al-Latif (the secularist candidate in Basra), Abd al-Karim al-Anizi (Tanzim al-Dakhil, Diwaniyya), Taha Diraa (a vocal independent from Diyala), Qasim Dawud (independent in Najaf), Muyin al-Kazimi (ex provincial council leader for ISCI/Badr in Baghdad), Daghir al-Musawi (a militia-affiliated character who has been influential in Basra for some time), Hamid al-Hayis (the “Sunni cover” in Anbar), Sharif Ali bin Hussein bin Ali (ditto in Baghdad – no monarchy in Iraq anytime soon it seems), Muwaffaq al-Rubayie (949 votes in Baghdad so far) and – wait for it – Ali Faysal al-Lami, the de-Baathification director in Baghdad (so far only 590 out of some 324,000 INA voters in Baghdad have bothered to check his candidate number). Already old stalwarts like Jalal al-Din al-Saghir, Humam al-Hamudi and Hamid al-Muala have conveniently removed themselves from the public gaze by running as symbolic candidates in Kurdish and Sunni-majority areas (their hoped-for compensation seats now look doubtful), and of course Ammar al-Hakim decided not to be on any list at all. In sum, it seems the Sadrists were a lot more successful with their “primaries” last autumn than ISCI (who tried to copy them but clearly failed in identifying the right candidates in a process which looked rather bogus at the time, including SMS voting). One of the remarkable aspects of the Sadrist success is their ability to use the open-list vote strategically, i.e. by spreading the vote on a number of winning candidates across the list (the more usual pattern is that a limited number of highly popular candidates stand out). An interesting story by Anthony Shadid in The New York Times today hints about something that sounds like a district allocation key which may have played a role in this at least in Baghdad. Additionally, the Sadrists, led by a 7-man committee of scholars based in Najaf who have liaised with Muqtada al-Sadr, have put a great effort into promoting individual candidates and providing voters with information on their educational and career backgrounds. But Sadrist voters are not doing this blindly: Some Sadrist candidates have been effectively demoted, such as Qusay Abd al-Wahhab, number six on the original list in Baghdad, and a deputy in the outgoing parliament. It seems inevitable that the remarkable Sadrist comeback at some point will be reflected in different coalition-forming dynamics. So far, this tentative process has remained dominated by the old elites, but what is really the point in negotiating with a 16-man bloc such as ISCI/Badr? With 34 plus candidates, the Sadrist will form a sizeable contingent of deputies comparable to the Kurdistan Alliance and as such will constitute an independent centre of power in the next Iraqi parliament. 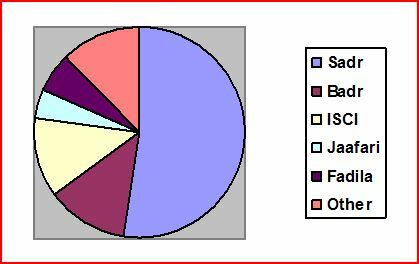 This entry was posted on Wednesday, 17 March 2010 13:52 at 13:52	and is filed under Iraq's 2010 parliamentary election, UIA dynamics. You can follow any responses to this entry through the RSS 2.0 feed. Both comments and pings are currently closed. This is very helpful Reidar, thanks. Building on the comment I left in the previous post, I think the new Quartet Coalition is going to be right about the 163 mark, although they may fall a bit short. To me, Maliki is clearly veering toward an alliance with the Kurds – that has been clear for days – and if we are to believe this report from al-Zaman (admittedly a hostile source from Maliki’s POV) Maliki has sent his office director to Tehran to negotiate. He realizes its close, and he’s not going to reach out to Allawi, who did poorly in Shia areas and whose bloc is overwhelmingly Sunni Arab nationalist. Recent statements by Fadhila suggest they will join, and I think Jaafari will as well, despite his personal conflict with Maliki. He will want to include the Sadrists simply because of their heft. That may be the real reasons for sending his man to Tehran – Maliki may already have sealed the deal with Hakim. So… given that they will have greater leverage, exactly what sorts of demands can we expect to see coming from Sadrist quarters? Well, this time they have committed themselves to briging in “technocrats”, which presumably means technocrats with the “right” approach and connections… And maybe they will demand guarantees that the withdrawal is kept on time and that there is no attempt to circumvent the SOFA semantically, I should think. Before the election Sadr’s main demand was that the government release his followers from prison and stop arresting them. Technicians well experienced in health administration and religious courts no doubt. Given what we know so far about the election results, what predictions can be made about whether Chalabi and al Lami will retain their positions on the Accountability and Justice Committee? Ali, but the problem is, the Sadrists do seem to represent something significant in Iraqi society, don’t you agree? Might they not be the single most dangerous group if they are isolated from the political process? Jason, I think everyone agrees that Chalabi & Lami are on their way out (a new AJ committee had in fact been lined up by the Maliki govt), and their dismal electoral performance will do nothing to reverse this. You are both correct about the Sadrists. One the one hand, the thought of them regaining ministries is terrifying. On the other hand, those masses must be integrated into the political process in order to eventually be assimilated into the new, greater Iraq. It is both painful and necessary. I agree Reidar, my only fear is competence. I just hope that they can rebuild Iraq without diverting funds from the ministry to the party. Looking back at all the debaathification fiasco posts, my honest opinion Reider is that Chalabi and Lami did Allawi a great favour. By victimising Iraqiyya, they on one hand made Allawi look like the defender of the Sunni’s, and as you pointed out in one of your earlier comments, cornered Maliki. I think Maliki was making a great effort to reach out to the Sunni masses over the last four years, but all that was undermined in a couple of weeks when he was put between a rock and a hard place. He couldn’t back Mutlaq and Ani after the comments they had made on TV in support of the Baath party, so he had to back the debaathification process. If it was indeed a trap for him, he sadly seemed to fall into it completely, he should perhaps have been more outspoken about the need for the process to be legal and FAIR. I think Salih Al-Mutlak in particular played it really well. He did not come out and criticise Chalabi and Lami, instead he picked on Maliki. To this day, he blames Maliki for his removal, and says he is willing to stand trial if Maliki is willing to do the same. I think he recognised that the real competition wasn’t 316, but the State of Law coalition, and I think their PR machine did a great job. My honest feeling is that Allawi wouldn’t have done much better in the south anyway, because people already associated him with Baathists, so it couldn’t have done him much damage. On the other hand, I think it damaged Maliki’s standing in the predominantly sunni areas. Zahra, yeah the personal vote for Chalabi and Lami is disastrous for them. My own take is that this hurt both Maliki and Allawi. Maliki damaged his nationalist credentials north of Baghdad and I think the Yusuf al-Habubi type of voter south of Baghdad may have been intimidated by the attempts at impromptu de-Baathification by provincial council leaders across the governorates, and that Allawi lost some voters for that reason. the Sadrists do seem to represent something significant in Iraqi society, don’t you agree? Might they not be the single most dangerous group if they are isolated from the political process? You might be right they left the drills to another thing! Reidar, i’m very interested on your views of what potentially could happen if maliki comes out on top with just a few seats ahead of Allawi. How will the alliances work, will allawi be included, what are the potential outcomes etc? Reidar, Thanks again for the analysis. You mention that the Sadrists might be the ‘single most dangerous group if they are isolated from the political process’. Another thought is that if Maliki is able to re-create a ruling coalition similar to the 2006 coalition, inclusive of the Kurds, ISCI and the Sadrists, and exclusive of many of the Sunni elements of Iraqiyya, we may be saying that some Sunnis are the ‘single most dangerous’ group. Politically they are more disparate than the Sadrist bloc, and generally many Sunnis have disavowed violence, but the thought is that, after having done so well at the polls in the form of Iraqiyya, to be out-maneuvered for the ruling coalition yet again would severly damage several years’ worth of reconciliation efforts (best exemplified in the Anbar Tribal Awakening and subsequent incorporation of the Awakening forces into government). This may re-create a sense of Sunni disenfranchisement and perhaps push some back toward violence. One would think that in such a scenario, Iraqiyya’s performance at the polls would almost force Maliki (if in fact he does create a ruling coalition) to make significant accommodation to Allawi and/or his Iraqiyya base, perhaps by offering the Presidency to a Sunni. Joe and Ali, my sense is that Maliki is looking increasingly towards what he first hoped to avoid, i.e. alliance with INA (plus the Kurds, who were always probably included in his plans). And then he may seek to add Tawafuq for decoration and a “Sunni cover”.Judging from the public comments by the IIP they will be ready to do more or less anything to get a seat in the next government. In general, I’ll probably postpone making any further comments on the results until the uncertified results are out, since they are probably around the corner, and since particular demographics such as the special vote and the exile vote etc will come into play in the final count, the latter filtering into the governorate vote. اثناء فرز الاصوات وقبل النهاية لاحظنا التالي …. وبطرحه من نسبة الــ 60% (831796) = 463410 ….!!!! If my memory is correct, isn’t a 2/3 majority required to select a president? And in 2005, didn’t parliament wrap the presidency into one total package of forming a govt, so that in reality it took a 2/3 vote to form a govt (even though technically only a majority is required)? If I am right, and that happens again, then even a Maliki/INA/Kurd coalition might have difficulty getting to 2/3. If they were to fall short, there would be no alternative but a unity govt created from scratch, and a chance that the MP’s would be forced to focus more on actual issues and competencies rather than mere personalities and political alliances that helped them get elected. It would be enormously messy and protracted, but if successful it could lead to a significant and meaningful advance in maturation of Iraqi politics and democracy. Reidar, thank you, I greed what you said. From what I read and a connecting the dots, there in more doubt there is some thing fishy in all of the process of counting the illegible voters to the number of voting forms and after that analysing the counting results and number. There is more than one source talking about above issues. Please if you could analysing or what your thought as you analysing each part of elections/ voting and numbers to give us more deep thoughts in this matter of the total number voted comparing to Iraqi censuses which the government in more than ones telling it is 25Millions, what about 14 Millions printed extra voting form..? Your more reluctant deals with the outcome at its face value but still things should be analysed from all accepts of the process as a democratic process, how much confidence that process have approved to us been real not fake and real democratic practise in new Iraq. Salah, I don’t think there is a single big conspiracy involved in the counting process. The good results for Iraqiyya in Kirkuk would not have been possible if the powers that be (the Kurds and the Shiite Islamists) had been able to dictate every aspect of IHEC’s activity. For conspiracies, I would instead look to the de-Baath process ahead of the vote and the post-election coalition-forming process. What about the internal dynamics of the Kurdish vote? As far as I understand the votes for KDP and PUK are clearly divided geographically. Since Gorran is making headway particularly in Suleymania, is should mean bad news for PUK. Indeed, doesn’t it suggest that KDP will come out as the by margin strongest Kurdish party? What are the prospects for an alliance between KDP and Gorran? What implications does all of this have for the formation of the government? Gösta, I prefer not to comment on internal Kurdish politics which I don’t know enough about and for which I lack the required linguistic skills. All I can say is that viewed from Baghdad, this will indeed look like a net strengthening of the KDP at the expense of PUK, and perhaps with Goran less formidable than some Iraqi non-Kurdish politicians had been hoping for. Accordingly, pre-election attempts by Maliki and others to deal separately with PUK and/or Goran may be of limited relevance to the upcoming negotiations where the KDP is likely to continue to dominate the Kurdish position. Still, we should not lose sight of the fact that the overall Kurdish position has been weakened, both in terms of the new rules of the game (more majoritarian) as well as with regard to seat numbers, all of which mean that the KDP runs the risk of overplaying its hand if it continues to make maximalist demands regarding oil and Kirkuk. If they persevere in doing so, the others will simply turn elsewhere, which was not an option in 2006.